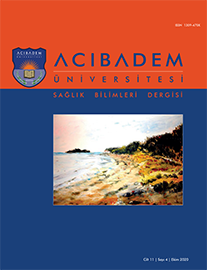 2Dokuz Eylül Üniversitesi, Fizik tedavi ve Rehabilitasyon Yüksekokulu, İzmir, Türkiye DOI : 10.31067/ausbd_7/0.2018.0 Purpose: The aim of this study was to investigate the relationship between age and other socio-demographic characteristics, and cognitive functions in older adults living in nursing home. Study design: A total 111 individuals (60 years and over) were included. Socio-demographic data were recorded. Cognitive functions were evaluated with Montreal Cognitive Assessment (MoCA). Results: Twenty (18.1%) of the individuals were aged between 60?69 years, 46 (41.4) were aged between 70?79 years, and 45 (40.5%) were aged between 80 years and over. It has been observed that cognitive function decreases with age (p<0.05). There was a positive correlation between MoCA and education level, and age in older adults aged between 60?69 (p<0.05). There was a negative correlation between MoCA and education level and a positive correlation between MoCA and hypertension (p<0.05) in older adults aged 70?70 years old. Also, there was a negative correlation between MoCA and age, and a positive correlation between MoCA and height (p<0.05) in older adults aged 80 years and over.